When the Dean invited us to curate an exhibition of contemporary sculpture in Gloucester Cathedral, we knew such a magnificent setting with its wealth of art and craftsmanship would undeniably be the centrepiece of the show. How then to avoid being overwhelmed by this awe-inspiring and historical space? We made the decision that to be successful we would have to aim as high as possible and choose objects that demanded attention, questioned convention and stimulated ideas. To this end we have been extremely fortunate in that every sculptor we approached has responded positively, lending us work that in some way or other is an apt complement to this incredible environment. 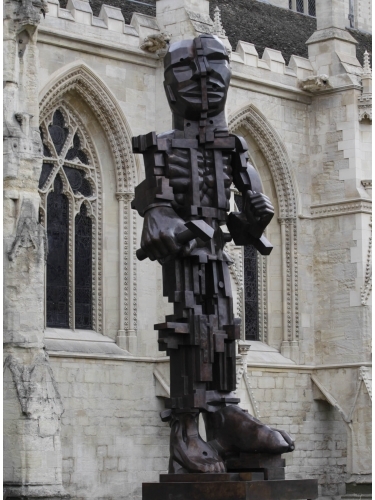 The result is a tremendous endorsement of the sculptural richness of our age and a fitting tribute to the medieval period, justifiably known as the ‘great age of sculpture’ in British history. The sheer diversity of the seventy-eight pieces with their varied form, texture and colour, warrants close scrutiny; many confound, others delight, some may make us laugh and others even induce melancholy. Sculpture articulates images and ideas in a primarily emotional way, responses that are felt as much as seen. Similarly, the awe that manifests itself within us as we enter the cathedral is an emotional reaction to the beauty, skill and composition of the building as much as it is to its religious significance. Imbued with ancient history and witness to so many great cathartic moments, celebrations, marriages, declarations, baptisms, memorials and funerals, the cathedral emanates an emotional calm and soaring aspiration. Personal faith finds public expression within the cathedral walls in the many plaques and tablets dedicated to the memory of loved ones. Such enormous diversity, such a range of expression, powerfully illustrates the vitality and vibrancy of the sculpture scene. We are incredibly fortunate to have had the enthusiasm of so many sculptors, galleries and collectors who have very generously supported this show by lending their valued works. The exhibition also celebrates the vision of the Dean. He foresaw how wonderful the sculptures would look in the cathedral and was not afraid of contemporary art.